Select from the two accommodation options on the property. 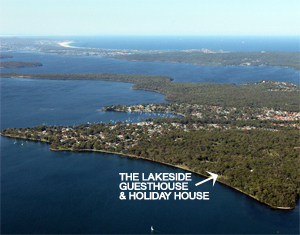 Both accommodations enjoy an uninterrupted view of Lake Macquarie. The Guest House, large enough to sleep 36 or more people is perfect for large events, family reunions, extended family holidays, team building functions and weddings. The Holiday House ideal for a large family, sleeps 12 people.